| Will the Air Force Do Anything To Rein In Its Dynamic Duo of Gay-Bashing, Misogynistic Bloggers? "First, women are not called to be pastors, and since a chaplain is supposed to be a pastor in uniform--it exposes their rebellion. "Second, the office is permitted for men only, and women are prohibited from teaching (1 Timothy 2:12). "Third, people should be very worried when they see women pastors/chaplains teaching. Why? It could be God's judgment upon them (Isaiah 3, "...and women rule over them")!" The above are the words of Captain Sonny Hernandez, an Air Force Reserve chaplain for the 445th Airlift Wing at Wright-Patterson Air Force Base in Ohio, posted as a comment on a blog post by Air Force Lt. Col. Jonathan Dowty on his "Christian Fighter Pilot" blog -- a blog on which Lt. Col. Dowty has provided his readers with a steady stream of misogynistic, gay-bashing, Islamophobic, and other very "Christian" posts for over a decade. In the post that Chaplain Hernandez was commenting on, titled "Kansas Army National Guard Commissions Female Chaplain," Lt. Col. Dowty had expressed his opinion that female chaplains are not acceptable, writing: "... there are some who advocate that chaplains should be able to meet the needs of all of their troops, and a `minority' chaplain actually undermines that cause. While every Christian denomination represented in the military accepts a male pastoral leader, a substantial percentage do not accept female pastoral leaders." 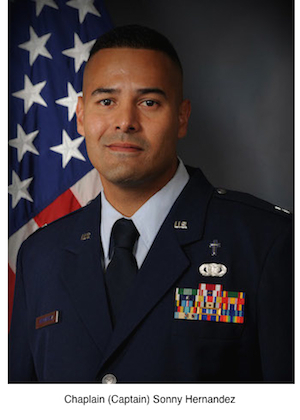 Chaplain Hernandez is not merely a casual commenter on Lt. Col. Dowty's blog. Since July 2015 he has been a regular contributor to what was previously Lt. Col. Dowty's one man show, writing such inspiring posts as "The Homosexual, Anti-Christian Agenda and the Military" and "The Transgender (Homosexual) Lifestyle: A Military Chaplain's Perspective." `Beware of false prophets, who come to you in sheep's clothing but inwardly are ravenous wolves." - Matthew 7:15'"
With both Lt. Col. Dowty and Chaplain Hernandez being so unabashedly misogynistic and homophobic, you can imagine their response to the appointment of a new commandant at the Air Force Academy who is both a woman and gay! "How did Col Goodwin -- an open homosexual -- enter the Air Force without lying?" By his publicly calling his superior officer a liar, and doing so in what was a clearly anti-LGBTQ context, the slew of military policies and regulations potentially violated by Lt. Col. Dowty is extensive -- ranging from the DoD's Diversity and Equal Opportunity policies to Article 89 of the Uniform Code of Military Justice (UCMJ) -- Disrespect toward superior commissioned officer. Lt. Col. Dowty's post led the Military Religious Freedom Foundation (MRFF) to file a formal complaint against Dowty. That complaint was sent by MRFF's attorneys to the Deputy Inspector General for Administrative Investigations. But it wasn't Lt. Col. Dowty himself who responded to MRFF's filing of an official complaint against him. For that task, he turned to his surrogate, Chaplain Hernandez, who proceeded to show his own utter disregard of all of the same policies and regulations listed in MRFF's complaint against Lt. Col. Dowty by writing a post on Dowty's blog titled "`BREAKING': Mikey Weinstein and the USAFA Commandant's Homosexuality," in which he defended his homophobic blogging buddy, claiming that Dowty "did not call Brig. Gen. (Select) Kristin E. Goodwin a liar. Instead, the CFP commentary posed a rhetorical question - by definition, one whose precise answer isn't relevant or easy to determine - to inspire discussion on philosophy - by definition, analysis of difficult problems - and morality at the US Air Force Academy and society." And, in addition to defending Dowty with his ludicrous "rhetorical question" defense, Chaplain Hernandez expressed his own opinion on the subject, with statements such as: "Leaders should be promoted because of sacrifice and integrity, not sexual immorality." Chaplain Hernandez's defense of Lt. Col. Dowty's homophobic, disrespectful, and completely unfounded accusation against Brig. Gen. (S) Goodwin has now led MRFF's attorneys to file an additional official complaint with the Deputy Inspector General for Administrative Investigations -- this time against Chaplain Hernandez. Will the Air Force continue to allow this duo of virulently homophobic, misogynistic bloggers within its ranks to operate as usual with complete impunity? If so, as I said at the end of my previous post, our military might as well just chuck out the Uniform Code of Military Justice right now and replace it with the "Uniform Code of Military Jesus." Talk 2 Action is simply perfect platform to find premium information about latest happening around the world. Find out custom essay writing service australia in Google and enjoy some amazing results within your limits. Hope you guys will find a perfect way. Yes, Really agree it is one of the best christian blogs out there. Wish you a early Christmas from Germany. If a Christian anchors his/her argument with a scripture reference the reader needs to sit up and take notice. It is a point of scholarship no matter how small or upsetting it may be. The military men and women are actually the spear point for the right to free speech so it would not make sense to ask for them to ban their speech or curtail it. Limitation of free speech of military are items they are asked to not divulge to the enemy. The man is correct women should not be lecturing men on spiritual matters on a regular official basis as in a female chaplain/pastor. The voice of Christian females should be saved for their traditional roles and to minister to other women. Christ, after all, is the head of the church not his mother Mary. He obeyed his mother as it is written. Would you make the same accusations to Muslim Imams? Probably not. Islam is even more male-centered than Christianity as far as do's and don'ts but you are afraid of being terrorized whereas with Christianity you are not. So respect the Christ-centered, scripture-anchored men and women of the armed forces period. That would be my suggestion. But in the real world of the USA which has never been and enver should be run by the Bible. What you say is true for you. If you had your own Christian military I could understand it. In your own Christian Nation it would be so. But it isn't and once you figure that out and there is no historical support within the context of the United States you will have to live in. Your main enemy in this? The Bill of Rights and Constitution does not support any religious breech of the secular state. No where. However you will notice that it has been breached in numerous places by presidents of both parties. And they will continue to punch holes in it weakening that wall till it falls and then you and your Christian soldiers will be marching to a new drummer and people like myself will be dead or enslaved as would be your wont. So excuse me if I don't like what you are saying. And many women in the county don't like it either. WE get to see it enacted in Saudi Arabia. Women did get the right to drive just this month. Most do no want your Christian nation. It is an abomination to our Founders and ourselves. No Gilead for us. First, it is insulting that you still hold that women should be beneath you as far as being a chaplain. Believe what you want, but that's the bottom-line. As for idea that Islam is somehow untouchable; first, this is a website that uncovers the words and deeds of the Christian right so Islam is not the point here, and is covered by more than enough websites, elsewhere. Second, the "whataboutism" that conservatives throw out is nothing more than a dodge from your own bigotry and sexism. Interesting dialogue you have put forward, never thought about it this way. I personally feel that a person's sexual orientation should have no impact whatsoever in their career. It's really saddening and thought provoking that a reputed institution such as the National Air Force is a home to homophobia. Last week, I had a research paper written about homosexuality from Management Writing Solutions. Symantec customer service offers numerous options to the customers to seek assistance for their problems. You can choose from any of the following assistance options to seek help from the customer support of Symantec. Hello,I must say I enjoy the content and thanks a lot for discussing this topic. Great work!. If you love free PC games, try this best horror games.